The word Flow represents so many things: movement, ease, softness, something that is constant, evolutionary but mostly it’s something without beginning or end. Infinite. The initial idea behind FlowArte was using my watercolor work to design beautiful leggings for movement artists, like dancers or aerial yogis. But I also suspected that the idea would eventually change and I wanted a name that would work with anything that I wanted to do. The only thing I was sure about was that it would be art related. But I knew, because of my personal history, that I wouldn’t stick with a single thing forever. I’ve been extremely hard on myself because of this. I mean EXTREMELY. I have put myself down in ways that I would never do to others. In fact when a friend has come to me with almost the same problem, I offer her comfort and encouragement and emphasize that she’s exactly how and who she’s supposed to be. And I believe it. So why can’t I do the same for myself? And it struck me: I do not practice self-care at all. I am constantly pushing to what’s next and evaluating progress/success in terms that are completely external. I castigated myself for money spent, for money not spent, for forgetting something on my calendar, for staying in, for going out. For not trying “hard enough” but mostly for not focusing. During 2017, every time I had a new idea, I would stomp on it. I used to relish each and every one. I was doing a small business program and I was going to make it work! I had to focus on ONE thing. But before I knew it, my head was creating all sorts of alternate universes, artworks, stories, ideas. I was reading more books, novels, graphic novels, etc. I was discovering plant based eating, new ways of writing. I was practicing realistic portraits AND illustrative portraits, I was painting flowers, and jewels and animals. I couldn’t, for the life of me, just do one thing. And then, thanks to Greta, I watched Elizabeth Gilbert’s Flight of the hummingbirds. A talk she gave in 2015 and I just bawled my eyes out. FlowArte is my creative playground. FlowArte is where I experiment with words, pictures, and ideas. FlowArte is where I draw and paint. FlowArte is where I write about my take on creativity. FlowArte today is watercolor but tomorrow it might be collage, or ink drawings. You can be two or three things at once. And today I had the perfect example. This is the most beautiful short movie I have ever seen. She embodies my ideal of what FlowArte represents. Soft movement, freedom, without a single direction. It’s just fluidity in action. She is a deep diver, a dancer and a filmmaker. Well, I’m a writer, designer and visual artist with a penchant for philosophy. If I publish paintings with quotes, if I create leggings because watercolor represents movement and I write my e-zine about a wide range of topics is it confusing? I am so tired of fighting who I am and how I am. Of course there is always the financial issue and how focusing on one thing would probably give me better results but I’m not able to. Too many years trying and not succeeding and being blocked because I’m waiting to find something that will pull me in and not let me go. I have endless curiosity. I do not know what boredom is. I still have to explore. I still have to try things, I still have to trust myself. I still have to negotiate with my own little negative voice about my ability, skill or talent. 2018 has so far been about answering that question about self-care. I used to think it was to drill positive thoughts into my head, despite the fact that I’m a happy pessimist or a negative optimist, however you want to see it. Going down the wellness rabbit hole, double-guessing my choice of workout, food or habit. But self-care, I think, is striking a truce with that thing in yourself that provokes a battle. Once the peace treaty is in place, that pinch in your heart eases up. The begining of my reconciliation with Yoga. A 30 day journey. For years I said I didn’t like Yoga. I first tried it almost three decades ago in Mexico. The instructor wanted us to take a cold shower before and after the practice and to push our bodies to the max. Needless to say I never went back. Later on, I went to a studio in Montreal and the instructor was far from engaging. I was not able to do the poses while the person beside me was basically standing on her head. Plus the inflexible person that I am just made me proclaim: no, yoga is not for me. I also have very fragile wrists so any downward dog was automatic pain. On an off I’ve tried different versions, videos, DVD’s from the super slow to the crazy power yoga type. But since I spent a month sitting in a tiny Airbnb in France my body becoming a stiff broom, I vaguely remembered someone mentioning Yoga with Adriene and I looked her up. She has managed the impossible. I’m starting to like it. It’s almost crazy. I appreciate her super laid back style and of course, her co-teacher Benji is adorable. I decided not to participate in any more challenges, though many have crossed my path and I’d love to take them on, not least the 100 day project. But I knew it was not the right moment for me. I’m currently using an app called Cold Turkey Writer and it’s been a life-saving tool. You enter the number of words or minutes you want to write without interruption and it blocks the entire screen until you complete your goal. You can’t do anything else. If you are a writer, I totally recommend it. Opening my sketchbook from December. The groundwork is there. Sometimes it’s better to work without an intention and then come back to it a few weeks later (or in this case three months) and feel your jaw drop because hey, not everyone has a perfect workflow but you did make progress! My favorite kind. No destination, just pick a direction and go. A couple of years ago I got Keri Smith The Wander Society. I used to do it regularly until we got Boris. Wandering with him doesn’t get you very far. He needs to sniff and pee on every tree and fence. But Friday I stepped out on to St-Laurent Boulevard and picked a direction up or down. And took off for about two hours. It was freezing but it felt so good. 5. Reading from my eclectic personal library, from a turn pager to a biography. Books simply contain happy pills. I’m writing this from Montreal. The month in France came to its conclusion. We are home. It feels strange to look out the window and see the same sad, post-winter backyards, the patches of snow that refuse to melt. The trees that can’t grow leaves because the weather is still not warm enough. It was hard to be away for a month and yet, it seems it went in a blink of an eye. The final week was a struggle because most regular Airbnb’s are usually furnished for short term stays and if you are staying longer there are a few additional things you have to take into consideration. For the entire month I couldn’t do any sort of workout. One day I tried to do Essentrics but it didn’t work very well. I didn’t have a yoga mat and the floor was slippery. The chairs were hard, the futon was excruciating. The street was incredibly noisy. People yell a lot at night. I had a pile of art supplies. I’d brought everything: good watercolor paper, two sketchbooks, two palettes full of paint. I had the Pentel paintbrush, water brushes, microns, you name it. And yet, I could barely take out a pencil. I didn’t know what to draw, what to paint. I was completely uninspired. I was stressing about this major pause in my projects, about how I would get back to the swing of things. Here I am, demanding the water and color to converse. One day I painted a cow, another day, simple textures. A portrait too. 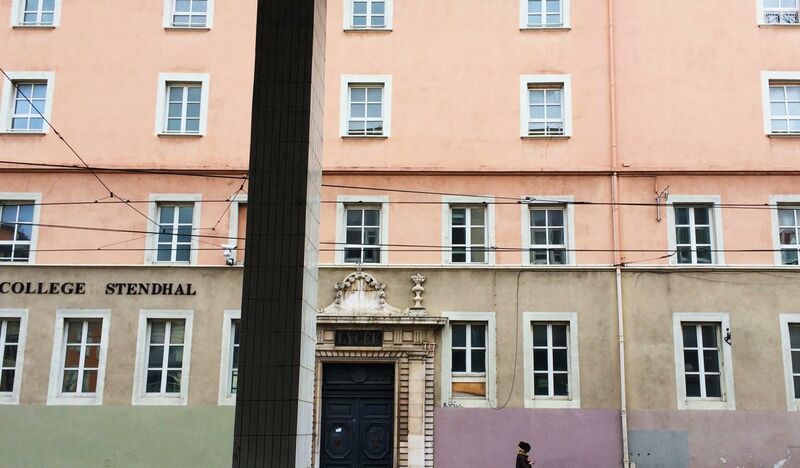 We visited a small town called Aix-les-bains. It has more charm than Grenoble and it’s a lot cleaner. They have a beautiful lake which we found after walking aimlessly for about an hour. It was the first day in months we were able to sit for a good while in the sun. I managed to pull out the sketchbook and just went back to the basics. Value studies, thumbnails. At that point I realized my impatience has hindred me more than I thought. In my quest for becoming good quickly, I skipped essential practices that are extremely powerful. Doing pencil studies before painting is so helpful, especially when you haven’t yet trained your eye-hand coordination. I’m so “desperate” to paint with my brush and stop having to sketch in pencil that I ruin more paper than I want. As I did these quick studies, I realized how my lack of humility and patience had blocked me during this trip. I truly believed I would walk around, sketchbook in hand and paint these amazing urban landscapes. 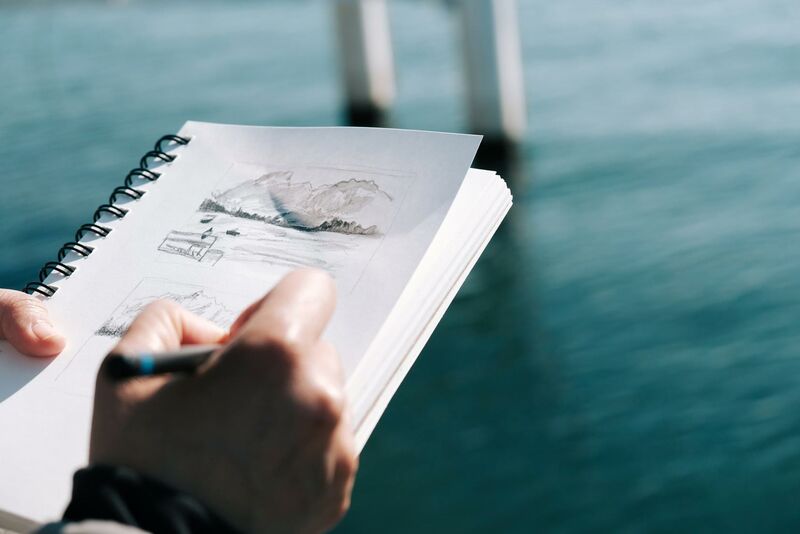 Well, surprise Luisa, you haven’t practiced in a year and… do you really want to do urban sketching? As I felt the month winding down and very little to show for it in terms of art making, I was feeling discouraged. But then I noticed how as I did other activities, like writing and reading for hours (sometimes until 2AM) my brain was giving me a direction. It was telling me that yes, I can paint watercolors, I can keep practicing urban sketching, I can continue to make beautiful leggings for the poets of body movement and create artwork for lovely notebooks. I can continue to make portraits, but there has to be a common ground. There has to be a meeting point where my love of words, pictures, philosophy and ideas meet. And so I didn’t paint much, but I came home with the seed of a project. Its time has come. If you’re subscribed to my newsletter, you had a brief introduction. I am reaching out to people quietly and gathering stories, thoughts, perspectives on a topic that is rarely discussed. I feel like I’m finally finding a thread. Donc, merci la France, for the bookstores, for the magazines, for the exhibitions. For the pastries and the fantastic wine. For the mountains, your beautiful language, the delicious morning bread. For the color palette, the postcards and the diversity you still embrace. All photos by the love of my life. I am in a city that does not have the stereotypical French glamour. It’s not Paris and it’s not the charming little wine village. Some days I don’t even feel I’m in France if it weren’t for the pastries and the daily wine. So this week three has been less about feelings of travel than it is about trying to do something productive with my time. I’ve done a lot of writing. Not much painting although I did attempt a small illustration to practice the humble watercolor process. Watercolors are easy to transport but you still need a bit of a setup and since the Airbnb is tiny, I have to clear up everything afterwards, this routine doesn’t help my motivation too much. Yesterday I had a very overwhelming feeling of sadness because I had nowhere to go except roam through the uninteresting streets that I have roamed fifty times already. I could simply stay in the apartment and hammer away at the computer, but then again. Why come this far to do that? When you post a photo of your laptop beside a mango cocktail, did you really enjoy it or was it over before you even noticed, as you typed the perfect caption for your Instagram photo? Of course I am happy to be able to travel but sometimes travel is not quite vacation and the thought of not taking advantage of being abroad vs. working is a conflict that I can’t seem to resolve. As a routine sets, the days speed up and suddenly it seems like I was never really here. Oh, darn. This brain of mine. So I take a walk and give myself a mission. Go to a bookstore where I’m happiest. There is so much to read and such little suitcase space. I wanted to find the new book by Ina Mihalache / Solange, who I deeply admire for the simple reason that she creates what she’s compelled to create. She is fearless though her Solange character seems the opposite. I spent a couple of hours browsing books, sighing at every turn. It suddenly dawned on me that I’m reading French as I always dreamed. No barriers. I absorb a different kind of literary beauty after years of reading exclusively in English. The variety of stories and characters amazes me. In the past few years I’ve felt like there is a fuzzy similarity among American and Canadian books. They all seem written by MFA graduates following a formula. They don’t inspire me. On the other hand literature in Spanish has a different problem. Working at a bookstore specializing in hispanic literature I should know. Every time we get the new releases, four out of five books has a writer as a main character. Really? There are no other possible main characters? Bookstores are my refuge. My life seems to gravitate around either a bookstore or a library. I recently revisited that classic video on How to be alone. I remember it revolutionized my heart. So as I roam the city of Grenoble while my husband has work to do, I remember this song/poem and I go be alone where I feel most happy. I’ve mentioned Marc Taro, a watercolor artist from Montreal. 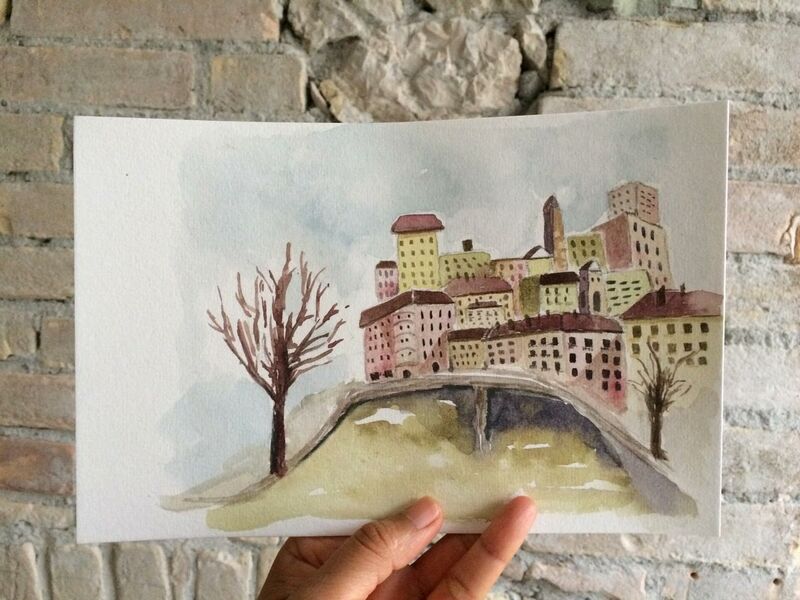 He is an Urban Sketcher and Fine Artist and I’m a bit obsessed with his most recent watercolor process. I’ve taken his Travel Sketching in Mixed Media class on Craftsy and it is the best explanation I’ve encountered on how to start, progress and make really beautiful drawings on location. Only problem? I don’t practice enough. I only try to practice when I’m travelling. Why? I guess I’m still self conscious about drawing in public. If someone approaches me while I’m drawing and talks to me, I think I’ll faint. When travelling I have my not-so-patient husband so I only do little thumbnails here and there. Lately Marc has been taking his work to another level. He’s doing things that no other watercolor artist is doing right now (in my opinion) and mind you, he has YEARS of experience, but it’s driving me crazy because I want so much to paint in a similar style. I love watercolor for it’s fluidity and it’s willful blending and he has taken this to beautiful heights. Just look here. 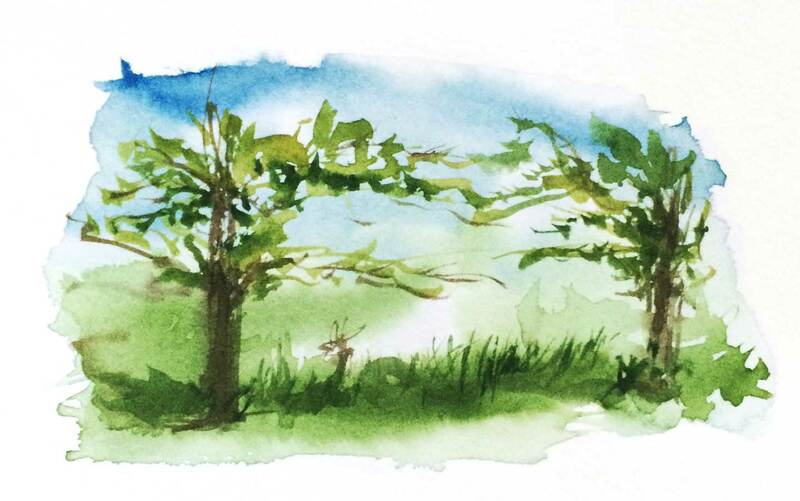 He recently published his Direct Watercolor book and I got it the minute he released it. I looked at each page in awe. A little humility Luisa, please. So I grabbed my brush and said, here I go. Well, not really. First of all I lost all sense of proportion and perspective. Second, painting buildings isn’t my most joyful place. I love to look at travel journals and I’d love to illustrate my own. But since I don’t practice enough, I can’t just pull out my my sketchbook and brush and expect to paint something wonderful. My desire is so great that for a second I believe that when there’s a will there’s a way and then proceed to ruin a page. So after my initial frustration I did a few small thumbnails and the very basics: horizon line, one point perspective, two point perspective. These are incredibly helpful for fitting your drawing on a page, working the composition, nail the perspective (somewhat in my case) and place shadows and darks. Once you have that, you can transfer your sketch to your watercolor paper and you draw it a second time which is more practice! I would love to forsake the pencil, a hefty ambition since that’s what Marc does and sometimes even he has to plot some points. But in this case, I just went with pencil. And lastly I completed the darks. So I recognize I’m extremely wobbly and unsure when it comes to painting cities or buildings. My practica has been mostly with flowers and abstracts and this is like FAR cry to what my ambitions are. But I’m happy that I could revisit concepts that I hadn’t practiced in almost a year since I went to Seville and that I captured the color and feel of this city. One thing though… I forgot the Alps. One month in France, week one. As I walked down the stairs of our Airbnb I told my husband (again) that I was in turmoil because I couldn’t decide where to focus my energy, what my priorities should be now that we are in France for the whole month. I finished the MBSR and I thought: I’m well on the way to learning to approach things a little different. But noooo! My brain is too set on its anxious, overdrive ways. It controls me. And so, I resisted coming to France for so long because I didn’t want to leave my projects hanging (plus flying!) I made sure I brought everything I needed to get my work done, both on the e-commerce front and the watercolor front. But when you’re travelling and working, not necessarily all the time but for a longer period, a feeling seems to develop: “I should be out there exploring” versus “I should be working”. And so I’m here in a small, very French, studio, tramways are passing by on the street below, cars honking. I look out the window and see this beautiful European architecture in the foreground and the beautiful Alps in the background. And then it was clear as the snowy mountain against the blue sky: I love France. I love being here. I love the lifestyle but most of all, I love their culture. There are bookshops every few blocks, there are magazine shops and stands all over the place. People still READ THE PAPER on paper. And the conversations… oh my, I was here in 2014 for three months and nothing has changed, people actually have what seems, in-depth conversations, not small talk. I don’t see people walking with their phones out like zombies. Or at least not as much as in North America. There is this quality of life that feels so good. Sure, the French have their quirks and I don’t think I would be able to live here full time, despite my husband’s dreams, but I wouldn’t mind spending a full year. We walked the streets being careful of the Tramway and we ended up in a little cinema where no pop corn is sold, so no munching and paper crunching during the film. We watched Three Billboards in a tiny theatre on a Monday night. Walking home afterwards surrounded by beautiful buildings is what romance is made of, I must say. Finally, one week after arriving here I finally pulled out my sketchbook and used just two of my new paints: Daniel Smith Moongloow and Quinacridone Gold and painted tea and tea cups beside my pile of museum brochures. I knew I would reach this state of calm acceptance but I also needed to not fight the tsunami that comes from being plucked out of my environment and my routine. I’m sure it’s hereditary. A belated Five Things Friday post. We´re going to France for a month. My feelings: I hate the airplane, I love France. Life is surprising. Time for delicious coffee, bread, wine. The challenge in France and particularly in smaller towns is to maintain a plant-based diet. Too much cheese! I hope there is a farmer’s market near where we’ll stay. I purchased Mark Taro’s latest book. The second I saw his direct watercolor paintings a couple of years ago I was obsessed. He’s my favorite watercolor artist, period. Take a look at his mastery. Thanks to him, I think I’m ready to graduate to fine artist grade paints. One of the biggest myths about watercolor is that you shouldn’t use pigment direct from your tube or paint, that you should mix everything. Well, not if you use paints that are made of two or three pigments. Most fine artists will say, noooo! you can’t you have to use one pigment and mix your own colors. But Marc has taught me (through his blog obviously) that you can use paint direct from the tube, but not just any paint. I read The Human Predicament by David Benatar. This is the most important book I’ve read in almost twenty years. However, it is a heavy, dark, pessimistic philosophy and not for everyone. After I finished it, the crack in my heart had become a fault. But there is comfort knowing that someone else out there can eloquently say what I’ve been thinking for more than twenty years. After a few days after finishing it, recognizing moments of beauty and spontaneity became easier. This, coupled with my MBSR is giving me a different perspective altogether. Still have a long way to go though. The second discipline that inspires tremendously besides visual arts is dance. I had the privilege of seeing Margie Gillis’ Viriditas last Friday. I’m still under the enchantment of seeing three women of different ages, express every possible emotion just with their bodies. I sustain that I am a frustrated dancer. A meditation retreat, though technically this was on Saturday, I’m writing this on Sunday. As an introvert I have no problem spending hours or even days in silence. In fact, that’s how I enjoy being with people the most. The year I did NaNoWriMo, the most productive days were when I joined a writing group where everyone was hunched over their laptops typing away. There is an energy that covers everything when a group of people are doing the same thing in silence. Snow fell for the most part of the day. That soft, fluffy thing. The kind I love. It wasn’t cold. Just a perfect, memorable day. I wasn’t necessarily nervous until about 4:30 when I realized that I was doing my first art show IRL. You may have felt the same at one point: something that seems momentous is happening, maybe a speaking engagement, a feature in a magazine or blog. Maybe your graduation or your wedding or an exhibition, for example. All those things bring the spotlight towards you and it seems for a brief moment, you’ve achieved something grand. I may have a strange philosophy which I’m reluctant to share, but I’ll do it anyway because it’s helpful to me and maybe it will be helpful for someone else. This doesn’t mean to shatter dreams or self-deprecate or undervalue things. What I mean is that if you put too much weight on something, it will probably never meet those high expectations. If you have low expectations, the result will always surprise you and even if it doesn’t go well, you won’t feel crushed. This philosophy has helped me manage levels of disappointment. Of course, when I’ve secretly wanted something very badly and it doesn’t happen, I am indeed crushed and it takes me a while to get over it. Usually it’s something I’ve left to chance and superstition, but when an event is set and I walk into it with curiosity and low expectations I am 97% of the time happily surprised. There was an art show. Have you ever come across someone who is doing what you want to do and wonder, hey, how did they get there? It happens to me often. And up until last year, I thought it was truly a case of “build it and they will come”. But in reality, every event, from tiny to grand, has so many steps. Not least, saying YES. I live in a neighbourhood in Montreal that is not well known. In fact when people arrived they were joking that it was the first time they rode the Green line to the very end. Archibald & Alistair is a lovely café near my house. The first time I went there I got so excited I texted my husband: we have a café!! And a million emojis. 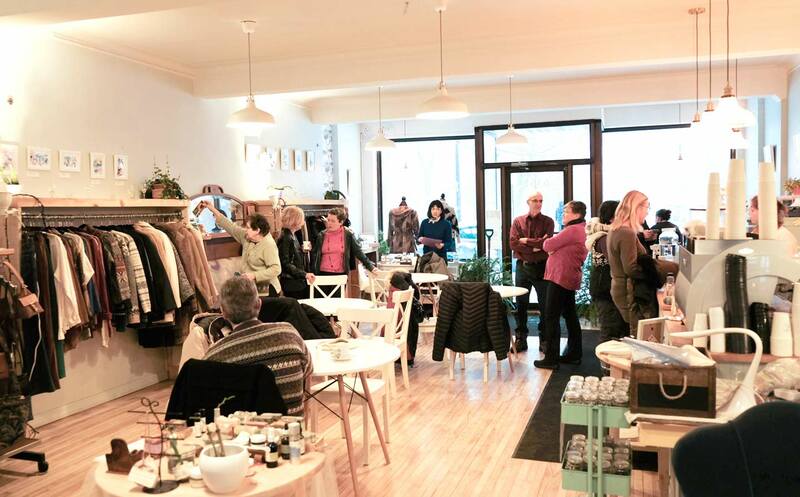 We used to live on the Plateau, so I was missing my weekly coffee crawl. I went a few times, followed them on Instagram and Facebook and genuinely interacted with them. At one point I went and offered them some greeting cards on consignment and they said yes. Part of their mission is to promote local artists. They exhibit a different artist each month. After my 100 day project, I focused more and more on watercolour and at the end of 2017 they asked if I’d like to exhibit my work. A first art show! Getting your first art show, despite your introvert self. Two weeks before the exhibition I was about to balk. I didn’t know how to frame things, how they would look, if my work was good enough (always the question…) what would people say? But little by little, overcoming my fear and my procrastination, I purchased frames, cleaned them, did last minute touch-ups to some paintings. Made a list, wrote a bio, made the little cards that go with each painting. And I promoted the show. This was by far the hardest. And yes, we all know that it shouldn’t feel awkward or yucky but it does. I showed three portraits. Which I haven’t shared on social media. These portraits are very personal. This one for example, is one of my dearest friends. A woman with a personality unlike any other, so intelligent and cultured, so authentic and yet mysterious. She’s not on social media. She’s out there living her life. Touching other’s lives with her unique way of teaching. Nobody can ever forget her. And this, a portrait of Camille Claudel. Camille’s story fascinates me. The movie with Isabelle Adjani is one of my favourites. I’m also showing a series of mono prints that I made using glass and watercolor. After failing to get prints I liked on the Gelli plate, I looked for ways to do printing with watercolor. Five of the best results are on display. Two sold! It was a lovely, casual, friendly evening. I was able to relax and talk a little about my work. I happily took compliments and enjoyed the moment. Sometimes small events are the best for dipping your toes, especially if you’re an introvert. Simply take the opportunities that feel right for you. I usually feel I have to take every opportunity that comes my way and there have been times when the stress of it has not been worth it. If I’d been in a frenzy treating this as a live or die situation, like opportunities sometimes feel, it might have been a very different experience. If I’d expected sales, amazing contacts, partnerships and all that business stuff, I would not have savoured it. Instead, I enjoyed hearing about upcoming marriages, babies, travel plans. Gather recommendations for our upcoming trip to France, discuss a favourite topic of mine: handbags! So if you’re an artist, small business owner, freelancer, be on the low-expectation spectrum, take the opportunities that feel good and enjoy the moment. It’s cliché, I know, but it’s also a great place to be. Little by little you climb the mountain. Or something like that. As much as it feels like the weeks are like a sneeze and you can’t see them go by, making this Five Things Friday recap will definitely give me some perspective. Especially when it feels (so often now) that I work so much and see so little results. It was comforting, as misery really does love company, to listen to a well known illustrator admit to not having had inquiries during the month of January. She is someone who has gained a lot of popularity on Social Networks. Or am I climbing the wrong mountain? I confirmed the opening date for my exhibition! It is the first time I will show my work in person. I’m really nervous. All the self-doubt monsters are chanting loudly. It is never easy despite knowing that I’ve made progress that I can allow my work to hang on a wall. It was a wonderful surprise to be asked by this small café in my neighbourhood. I bought a box of Prismacolors a year ago and I hadn’t used it. See previous post about my clean-up. I decided to give them a go. Be a beginner again. I know nothing about colour pencils and it felt like I was wrangling them into submission. I had a hard time blending and shading. Portraits are becoming a thing for me. I love doing Sktchy portraits in the evening. I love I can sketch real people instead of models from magazines which I started to do waaaay back in 2014 I also prefer Sktchy instead of creating from my imagination because I usually end up drawing the same face over and over. 3. A weekend at the cabin. What luxury. No internet, just silence, light and painting. Lots of watercoloring, lots of experimenting in joyful flow. 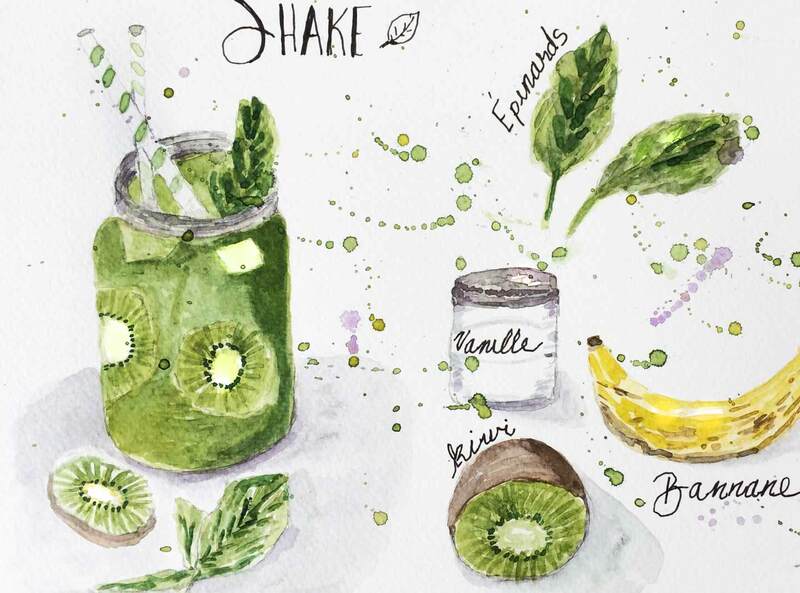 My first incursion into recipe illustration. I created a set of four printable Valentine’s cards. Though I know Valentine’s is a double sworded holiday as most holidays are. For some, they are painful reminders to what is missing whether it’s Mother’s day, Father’s day and all the rest. I was inspired particularly this year because of my tenth wedding anniversary. I feel it’s a milestone and as I painted these hearts in different colors I thought about the little things that show love day in day out as opposed as the grand gestures that movies, media and society keep showing us. A simple printed colorful card to acknowledge what we truly value is enough. And it applies to friends, family, significant other, co-workers etc. Week three of MBSR showed me how truly one single sitting can leave me feeling refreshed. I tried the meditation stool which is definitely my preferred way of sitting in a “dignified” position as my instructor says. I haven’t practiced as much as I should, I italicize because obviously that is a thought that comes like a Pacman to eat at my experiences.